Visitors to Fremantle Prison can now walk in the shadow of Western Australia’s convict past, following the installation of a two-piece 14 metre metal silhouette along the Fairbairn Street entrance ramp. 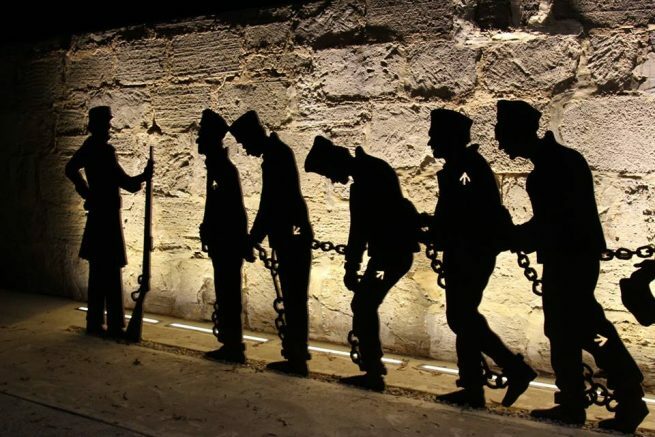 The new interpretive sculpture depicts a group of life-size convicts and pensioner guards on their arrival to Fremantle, highlighting the ramp’s significance as a historic convict pathway. The Fairbairn Street ramp was originally built by convict labour from building rubble found on the Fremantle Prison site. The ramp was the primary pathway along which convicts were led between the prison and convict transport ships anchored at Fremantle Port. The Fairbairn Street ramp is located in the buffer zone of the World Heritage-listed Fremantle Prison site. “This is a visually striking addition to Fremantle’s heritage narrative,” said Heritage Minister David Templeman. State Member for Fremantle MLA Simone McGurk said, “Fremantle Prison is already a heritage icon, attracting thousands of visitors every year.